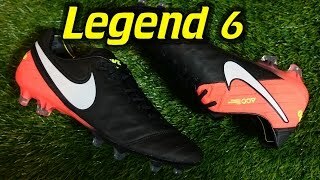 The Tiempo Legend 6 is the elite level boot of the Tiempo range. Favoured by a host of top professional defenders and midfielders, this boot is ideal for players looking for maximum comfort and protection in a football boot. 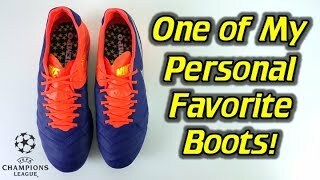 This boot offers several other performance benefits, with improvements in touch and passing among them. Nike has included a seamless kangaroo leather upper to the newest version of the Tiempo 6. Ensuring that dirt and water cannot seep through the seams resulting in the leather hardening. The new design structure allows the boot to offer all the benefits of having premium Kangaroo leather – including foot lockdown, comfort, and stability – but with the added benefit of one seamless upper, which prolongs the life of the boot. This boot is suitable for all weather as the seamless upper has been coated with Nike’s all condition control treatment, keep you safe and dry in any climate. The Tiempo design team have made another significant improvement to the upper for the Legend 6. 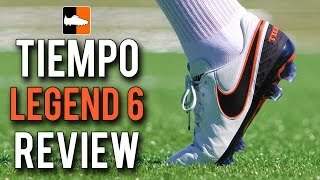 Unlike previous Tiempo’s the Legend 6 now has an integrated tongue, with is part of the upper. This increases the comfort and protection from the boot, whilst creating a larger strike zone which improves shot and passing accuracy. 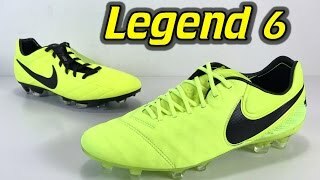 As with previous versions of the Tiempo Legend, Nike has opted for the use of the Kanga-lite and premium kangaroo leather. Using both materials provides a better lockdown feeling and more stability when running. Protection is increased by the new design of the heel area. This new moulded heel design add extra comfort and protection to a vulnerable area of the foot. Nike’s arrangement of Kanga-Lite in the heel area and premium kangaroo leather on the upper front of the boot has increased the flexibility and comfort of the boot allowing you foot to move throughout. Another aspect of this boot that makes it perfect for defensive players is the shock absorbing insole, made from Poron material. This ensures players can go into tackles with full confidence as the protection provided supports their feet. The protective insole is held into place by silicone dots around of the outside of the insole. 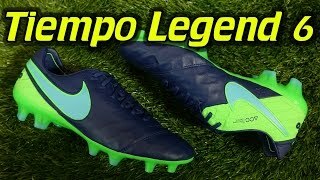 The Tiempo Legend 6 is already being touted as a classic boot. 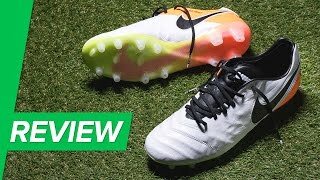 With unrivalled comfort and protection, Nike has pulled it out the bag with the updates on this version ensuring the ever popular Tiempo brand continues.